Usually ships within 3 business days, let us know if you need it sooner. This is the original version of the pattern with a spiral bound booklet and quality paper pattern. Click here if you would like the downloadable version. The Angela Bootcut Jean is a stylish lower-rise jean pattern that will flatter every shape. Contour waistband falls 2" below the natural waist in the front, higher in the back. I am thrilled to inform you that not only does this pattern come with a spiral bound book with directions, there is also a PDF file included with this pattern. The PDF file is downloadable and consists of full instructions, additional color photos, distressing tips, and other links. Now you can download the information to your ipad or other tablet! What a great way to follow the instructions, not to mention you can easily enlarge the photos and sketches. Indimidated about sewing jeans? 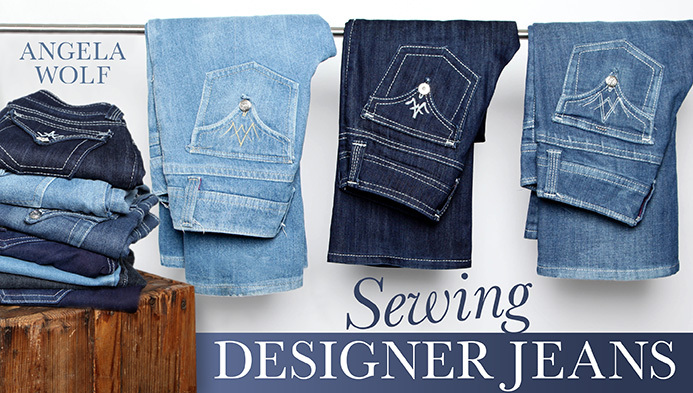 Join my online class today on CRAFTSY "Sewing Designer Jeans". You will be sewing your own jeans in no time! Absolutely amazing class!!! I have been sewing for many many years and I have to say I've learned so much from Angela in this one class - her method of teaching is brilliant with so much detail and visual explanation of what she is doing. I am thrilled with my new jeans, the first pair is just plain. But I am going to add some bling to the next pair. I have not been able to buy jeans that fit for years. I have long legs and I am thin, department stores usually don't carry anything smaller that a size 4, and if they do they are too short. Love the pattern, and I shared your site on facebook so all of my sewing friends can have jeans that fit too! Me and my friends will be the hottest old ladies on the block! Sorry but haven't gotten started on my Jeans! Busy with kids outfits for Halloween and Cosplay - lol. Been captured by Class on Craftsy site which features this pattern. Was lucky enough to actually speak to Angela when I ordered the pattern and have her input as to my concerns in making the jeans. The complete package including the booklet is very unique. Have never gotten a pattern with so much detail and support. Can't wait to begin the process. Thanks so much!!! Love the pattern to this point, I have only made my mock-up but the fit is already better than the last pattern I used. I am excited to see what my actual jeans turn out like. I say "Pattern Set" because you not only get a sturdy paper pattern, but also a very complete instruction booklet and access to more detailed PDF file and video links within the PDF file and great support. I never bought a pattern that had all of that. So, even though this was the most I've ever paid for a pattern, it was definitely worth it. I made a muslin as recommended. I did have to make adjustments to the length, crotch and for my sway back (every body is different). I haven't started sewing my jeans just yet, though, and am glad I didn't. I found out about Angela's Craftsy jeans class. I am learning so many tips and tricks for finishing the jeans. 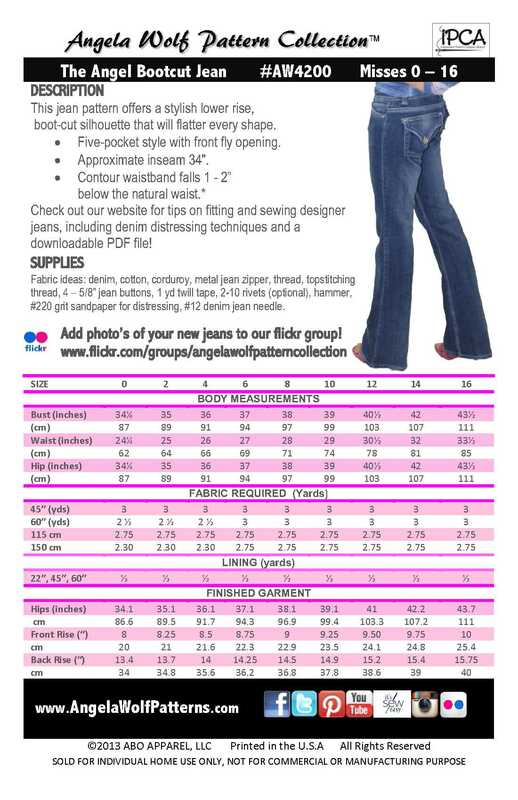 Empowered with the booklet, PDF file and now this fantastic class, finishing the jeans should be so easy. So excited to make these jeans! This pattern is very well done. I like the instruction book that comes with it. All the little extras here that are not in a commercial pattern help to bolster my confidence into believing this is very doable. I am excited to finally have jeans that really fit and making them myself is extra special. I haven't yet sewed this pattern but have reviewed the pattern and instructions! I have to say this is the best I have seen so far and can't wait to sew it! I have also signed up for the Craftsy cIass which I'm sure will be a BIG help! I am still in the process of finding fabric and threads needed! Will update you after sewing! I just finished my first (but not last) pair of Angela Wolf jeans. I have trouble getting jean patterns to fit me but I was determined. (something about my waist/hip ratio) I made a pair out of denim as my muslim in a size 12 but it was not stretch denim. I decided to make my pair in a size 8. I was sure it was going to be too small. To my amazement, it's perfect. I MEAN PERFECT. Finally a pair of pants that fit without any adjustments at all! I made some changes to the type that I wanted (skinny) and cut down the width of the waistband and I've got the jeans that I have been wearing from J Crew. The instruction booklet was amazing. I loved it. Kudos to Angela Wolf!